This paper aims to compare the spatial distributions of road accidents involving a cyclist that are officially reported to the police with those not reported (user-sourced dataset). We show that reported and unreported cycling accidents have similar spatial patterns and exhibit similar locational tendencies with respect to specific infrastructures and facilities. We illustrate the importance of defining a study area in the interpretation of the (cross) K-function results and show that cycling accidents are more likely to be unreported in areas where a small speed difference between slow and fast modes is imposed (traffic-calming areas). Because safety measures influence both accident rate and reporting rate, evaluation of their effect on cycling accidents requires careful spatial analysis. Cet article a pour objectif de comparer la distribution spatiale des accidents impliquant un cycliste qui ont été constatés par la police et ceux non enregistrés (données générées par utilisateurs). Nous montrons que les distributions spatiales des deux types d’accidents se ressemblent et révèlent des tendances spatiales similaires par rapport à certaines infrastructures. Nous insistons ici sur l’importance de la définition de la zone d’étude mais aussi sur le fait que la police a tendance à moins être appelée pour des accidents dans des zones où la vitesse des différents modes de transport est contrôlée (petits écarts de vitesse entre modes lents et rapides). Puisque les mesures de sécurité routière influencent à la fois le taux d’accident et le taux de constatation par la police, l’évaluation de leurs effets sur des accidents de cyclistes doit être analysée spatialement avec prudence. This research was conducted within the framework of the Systematic Analysis of Health Risks and Physical Activity Associated with Cycling Policies (SHAPES), a research project financed by the Belgian Science Policy (SD/HE/03A). The authors are hence also very grateful to Joris Aertsens, Bas de Geus, Bart Degraeuwe and Romain Meeusen for their fruitful collaboration during the entire research project. 1Making cycling trips safer is crucial when encouraging commuters to cycle and thereby contributes to health, environmental and mobility policies (de Hartog et al., 2010; Rabl and de Nazelle, 2012). Understanding the location of cycling accidents is hence of overriding importance for pinpointing where investments in cycling road infrastructure should be made. As in many other countries, cycling accidents in Belgium are greatly underreported: depending on data sources, only 7% to 15% of all cycling accidents are officially reported (see e.g. Lammar and Hens, 2004, 2006; Doom and Derweduwen, 2005; De Mol and Lammar, 2006; Aertsens et al., 2010; de Geus et al., 2012). Consequently, the identification of black spots and the underlying factors associated with cycling accidents may be biased, especially if unreported accidents exhibit different spatial patterns compared to the reported ones. Differences in spatial patterns and/or accident-related factors would indeed indicate that unreported and reported cycling accidents occur at different places along the network and hence that some explanatory variables may be neglected by focusing only on reported cycling accidents. In that case, a more complete registration of cycling accidents would provide additional and/or probably more accurate information about the significance of (spatial) factors associated with the occurrence of cycling accidents. 2This paper explores and compares the spatial distribution of cycling accidents registered by the police with those not officially reported, and inspects whether reported and unreported cycling accidents cluster around similar infrastructures, i.e. if the same environmental characteristics are associated with both reported and unreported accidents. 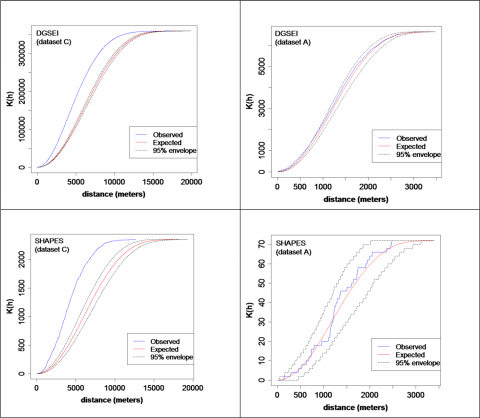 Our analyses were conducted within a fully urban area (Brussels, Belgium) and used comparative statistics, measures of central tendency and dispersion, as well as point pattern methods extended to networks, such as the network K-function and cross K-function (see e.g. Okabe and Yamada, 2001; Okabe et al., 2006a, 2006b; Okabe and Sugihara, 2012). 3Centrally located in Belgium, Brussels is a sprawling city (see e.g. Thomas et al., 2012). In this paper, we will analyse only the central urban part of the city: the Brussels-Capital Region (BCR), which covers 162 km² and has over 1.2 million inhabitants. As a capital city, the BCR attracts many administrations, head offices, schools, transport facilities, etc. It is the main employment centre of Belgium, generating more than 650,000 jobs and 20% of national GDP (Thisse and Thomas, 2010). Such concentrations, combined with a high level of accessibility, result in high traffic volumes and high congestion level. At the time of our survey, about 700,000 trips (all purposes) are registered in the BCR every day during the morning rush hour (6–10 a.m.), and among these two thirds are carried out by car (compared to 4% by bicycle). This is mostly explained by the high motorisation rate of the BCR and the urban sprawl in the peripheral municipalities (Dujardin et al., 2007; Brussels Mobility, 2010; De Witte and Macharis, 2010). 4In this paper, the BCR is further subdivided into three zones: the ‘Pentagon’ (4.5 km²) is the central part that corresponds to the medieval town centre within the current inner ring road (Figure 1). It is characterised by high employment (15,000 jobs/km²) and population (9,000 inhabitants/km²) densities and attracts large converging traffic flows. The ‘First Crown’ (39 km²) designates the neighbourhoods located between the inner ring road (outer limits of the Pentagon) and the greater Brussels Ring. Job density here (4,000 jobs/km²) is smaller than in the Pentagon, but population density (12,000 inhabitants/km²) is higher. Lastly, the ‘Second Crown’ (119 km²) corresponds to an area located between the greater Brussels Ring and the administrative boundaries of the BCR. It includes districts built during the twentieth century, where population and job densities are much lower (4,000 inhabitants/km²; 1,000 jobs/km²). 5Spatial analyses on networks were performed using SANET 4-beta (Spatial Analysis on a NETwork) developed by Okabe et al. (2006a, 2006b, 2009). Data collection was carried out in ArcGIS in a three-step approach: (1) a ‘bikeable’ network was defined and constructed over the study region (Section 3.1); (2) it was then used as a reference for geocoding cycling accidents (Section 3.2); and (3) key factors potentially associated with cycling accidents were selected and digitised (Section 3.3). 6The road network was provided by the Brussels Regional Informatics Center (BRIC). Approximately 120 km of that network were considered ‘unbikeable’ (motorways, access roads, express roads, bridges or tunnels) on the basis of Google Earth, BRIC and Brussels Mobility. The road network analysed here was thus 2,017 km long. 7On the one hand, road accidents are registered by the Federal Police and compiled annually by the Directorate-General Statistics and Economic Information (DGSEI). In total, 644 bicycle accidents were officially reported in the BCR over the 2006–2008 period. Among these, 95% of the cyclists involved in an accident were officially registered as ‘slightly injured’ (whereas the other 5% were ‘seriously injured’).1 The choice of the study period was guided by the period of the date of the survey (2008–2009), which was the only option for obtaining data about unreported accidents. In our view, this does not affect the final geographical results suggested in this paper. 8On the other hand, a year-long prospective online registration was implemented within the framework of a Belgian research project (SHAPES) in order to gain insight into bicycle usage and minor cycling accidents within the framework of commuting trips (Aertsens et al., 2010; de Geus et al., 2012; Int Panis et al., 2011; Degraeuwe et al., 2015). When a participant reported a cycling accident during the registration period (from 10 March 2008 to 16 March 2009), he/she was automatically asked to fill out a ‘prospective questionnaire’ to register information about the accident (circumstances, causes, consequences, etc.). In the first week of the participation in the survey, a retrospective questionnaire was also sent to the participants to register any cycling accident that had occurred during the preceding year. As a result of both the prospective and retrospective registration, a two-year period was covered by the survey, and 55 bicycle accidents were registered for the entire BCR over the period 10 March 2007‒16 March 2009. As expected, accidents that were not registered by the police (51 so-called ‘unreported accidents’) involved less severe injuries (i.e. mainly material damage, bruises, etc.) than those registered by the police during the survey (Aertsens et al., 2010). 9Reported (DGSEI) and ‘unreported’ (SHAPES) cycling accidents were finally geocoded by address matching techniques. The geocoding process used two types of information: (1) the accident data, which contain detailed information on the location of the reported and unreported cycling accidents, and (2) the reference data, i.e. orthophotos (BRIC, Google Earth) as well as the street network and house numbers (BRIC), which are both available in spatial formats and contain address elements that are compatible with accident data. Note that police-reported cycling accidents have detailed information on the address of the accident (i.e. the municipality code, the street name(s) and the house number in front of which the accidents occurred), while unreported cycling accidents have both GPS coordinates and address data. Cross-referencing such accident data with the abovementioned reference data allowed 93% of the DGSEI cycling accidents and 96% of the SHAPES accidents (from both the retrospective and prospective surveys) to be geocoded successfully. 10The infrastructure factors that are a priori expected to be associated with the occurrence of cycling accidents are presented in Section 3.3.1, and further implemented in ArcGIS (Section 3.3.2). The non-exhaustive list of infrastructure factors is summarised in Table 1. 11Bridges and tunnels are expected to be more dangerous for cyclists because they often correspond to sudden changes in road conditions (Khan et al., 2009). Bridges may reduce the visibility of road users and they are also more likely to be exposed to ‘extreme’ weather conditions (strong winds, ice development, etc.). Tunnels and road sections located under elevated infrastructures also force road users to adapt their eyes to the low level of light, hence increasing accident risk (Khan et al., 2009; Wang and Nihan, 2004). 12Traffic-calming measures are implemented in residential areas or close to specific facilities (e.g. schools). Vehicle speed is often limited through road design or hurdles (Pucher and Dijkstra, 2003; Pucher and Buehler, 2008; Rifaat et al., 2011), thereby also improving the perception of cyclists by motorists. Traffic-calming measures are expected to increase cyclists’ safety. Three kinds of measures are taken into account: 30 km/h speed limits, residential (20 km/h limits), and pedestrian areas (prohibited to motorised traffic outside delivery hours, but also to cyclists in some cases). 13Intersections (crossroads) are traffic conflict points (Wang and Nihan, 2004; Geurts et al., 2005; Dumbaugh and Rae, 2009). Their exact influence depends upon the type of crossroad. They can be grouped into six categories: give way/stop signals, right-of-way intersections, signalled intersections (e.g. traffic lights), roundabouts, intersections with a right-turn lane, and pedestrian traffic lights (Table 1). Roundabouts have been shown to be quite safe for motorised traffic, but they are not favourable to cyclist safety in urban areas (Hels and Orozova-Bekkevold, 2007; Daniels et al., 2008; Møller and Hels, 2008; Daniels et al., 2009; Reynolds et al., 2009). Signalled intersections are generally associated with a reduced risk of being fatally or seriously injured for cyclists, although they may lead to an increased risk of accidents with no or slight injuries (Eluru et al., 2008; Rifaat et al., 2011). For the other types of intersections (e.g. right-of-way, give way/stop, etc. ), there is little evidence provided in the literature about their impact on bicycle accidents. They are expected to be associated with higher accident risks for cyclists than ‘simple’ road links, since by definition they are places where the traffic situation is more ‘complex’. At such places, road users must handle many simultaneous visual and sound stimuli; this increases reaction time (e.g. due to the larger number of vehicles, road legs and signs, etc.) (Elvik, 2006; Dai et al., 2010). 14Tram tracks and public transport stops. Cyclists often report getting one of their wheels stuck in a tram track (Cameron et al., 2001; BRSI, 2006). However, available literature is not consistent on this point. Most of the research either focuses on accidents between pedestrians and trams (see e.g. Hedelin et al., 1996; Unger et al., 2002) or indicates in a descriptive framework that the number of tram-related accidents is relatively high for cyclists (Cameron et al., 2001; BRSI, 2006). In this paper, tram tracks are subdivided into three categories: tram-track crossings (at crossroads), tram tracks in crossable reserved lanes (generally built parallel to the road), and on-road tram tracks (built on the road, i.e. trams, cyclists and motorists all share the same road). Tram tracks built in off-road separated lanes (uncrossable) are not considered here, as they were not designed for bicycle traffic. The presence of public transport stops (bus, tram, etc.) is taken into account here, as it is expected to be associated with high levels of pedestrian activity that may in turn generate accidents for cyclists (Quddus, 2008; Cho et al., 2009; Pei et al., 2010). 15Cycle facilities and discontinuities. The provision of well-kept and planned cycle facilities is essential for reducing the actual and perceived risk of cycling accidents (McClintock and Cleary, 1996; Parkin et al., 2007). Both cycling facilities and discontinuities in the bikeable network are considered here. Discontinuities correspond to the end or an interruption over some distance of the cycle facility and are often observed at intersections. Cycle facilities are defined here on the basis of the terminology used by the Brussels Ministry of Mobility. They are divided into five categories: (1) unidirectional separated/off-road cycle lanes, which are one-way cycle facilities located next to a road and separated by a slight elevation or any other physical barrier; (2) bidirectional separated/off-road cycle lanes, which are two-way cycle facilities located either next to the road (with a physical separation) or fully segregated; (3) marked cycle lanes, which are one-way cycle facilities that are part of the road but reserved for cyclists and marked with painted lines and/or a (red-)coloured surface; (4) suggested cycle lanes, which are one-way cycle facilities that indicate possible cyclist trajectories on the road using either different road materials or chevrons and bicycle logos (but which are not exclusively reserved for cyclists); and, finally, (5) bus–bicycle lanes, which are one-way facilities dedicated to buses and cyclists. 16Parking facilities for motorised vehicles: parked vehicles often restrict sight and increase the risk of conflict with vehicles leaving parking spaces or with opening car doors (Greibe, 2003; Pai, 2011; Rifaat et al., 2011). In urban areas and during delivery or peak hours, vehicles are more likely to be illegally parked on cycle facilities, which may then force cyclists to leave the cycling path to overtake. The presence of parked vehicles after a discontinuity also seems to increase the level of discomfort for cyclists (Krizek and Roland, 2005). Two types of parking data are considered here: ‘function-based’ data describing the role/purpose of each parking facility, and ‘aspect-based’ data describing how parking facilities are positioned relative to the road. Five subcategories of function-based parking facilities are defined here: (1) park-and-ride, whether public and private; (2) delivery; (3) diplomatic corps; (4) disabled; and (5) taxi. In the case of aspect-based parking facilities, five types are distinguished: (1) longitudinal parking (cars parked parallel to the road); (2) head-in angle parking (cars parked at an acute angle to the direction of approach); (3) back-in (or reverse) angle parking (cars parked at an obtuse angle to the direction of approach); (4) parking facilities perpendicular to the road; and (5) ‘others’. Longitudinal parking areas are the most common type in the BCR, while the category ‘others’ is often found in public places or in residential areas. From a planner’s point of view, head-in angle parking is recognised as being risky for cyclists, as they are placed in the blind spot of the reversing or turning vehicle; conversely, back-in angle parking improves the field of vision and allows parked drivers to see passing cyclists before they leave the parking space. 17Contraflow cycling allows cyclists to travel in the opposite direction to the motorised traffic in one-way streets (Pucher et al., 2010). Contrary to popular belief, contraflow cycling is quite safe since motorists and cyclists face each other. They can keep continuous eye contact and adapt their driving behaviour depending on the specific street features (e.g. street width, presence of longitudinal parking, etc.) and the reactions of the oncoming road user (Brussels Mobility, 2010). The fact that motorists generally consider contraflow cycling to be unsafe may also increase the attention they pay to cyclists when passing them in the street (Kim et al., 2007). 18Urban facilities and public services. Irrespective of the type of road user, the number of accidents increases near employment areas, and more particularly near retail and trade facilities (e.g. shops, restaurants), manufacturing industry (e.g. industrial sites) and public services (e.g. schools, hospitals, etc.) (Levine et al., 1995a, 1995b; Greibe, 2003; Wedagama et al., 2006). Kim et al. (2007) also found that the presence of schools was associated with a higher probability of incapacitating injury. 19The infrastructure factors presented above were digitised either as ‘linear-shaped objects’ (e.g. cycle lanes) or as ‘point-shaped objects’ (e.g. public transport stops and intersections). About 10,000 intersections were digitised. Linear-shaped infrastructures were also spatially summarised by centroids in order to make the use of cross K-functions possible; network distances were computed between the location of the cycling accidents and these centroids. 20Data were digitised on the basis of aerial photographs (BRIC, Google Earth), printed cycling maps (Brussels Mobility, City of Brussels), accident data (DGSEI), online applications (BRIC), or GIS data (UrbIS database (BRIC)). For each factor, one or more data sources were used to digitise the GIS data and to monitor changes in infrastructures over time so that they could be related to the situation on the day of the accident. 21Comparative statistics identify whether (un)reported accidents are more likely to be associated with specific types of infrastructures: chi-square adjusted tests and Fisher’s exact tests for independence (for discrete data); Wilcoxon rank-sum tests (for continuous data). Odds ratios (ORs) and their lower and upper confidence intervals were further computed in order to compare the odds of observing a specific infrastructure factor in the unreported accident dataset compared to the odds of observing it in the reported accidents. 22Centrographic methods were first used to measure central tendency and spatial dispersion: spatial mean centre, central feature, standard distance, and standard deviational ellipse. Although these measures are useful in summarising point distributions, they are affected by outliers and do not reflect the second-order effects of the distribution, i.e. the spatial interactions between points (see Ebdon, 1985; Fotheringham et al., 2000; Myint, 2008; ESRI, 2009). In a second step, and as an answer to this concern, a reduced second-moment measure or Ripley’s K-function (Ripley, 1976, 1981) was used to analyse the spatial distribution of observed points (see e.g. Cressie, 1993; Bailey and Gatrell, 1995; Jones et al., 1996; Fotheringham et al., 2000). A network version has been developed, assuming that point events are constrained to a network, and distances between two of these points are computed on that network (instead of being Euclidean-based) (see e.g. Okabe and Yamada, 2001; Yamada and Thill, 2004; Dai et al., 2010; Myint, 2008). 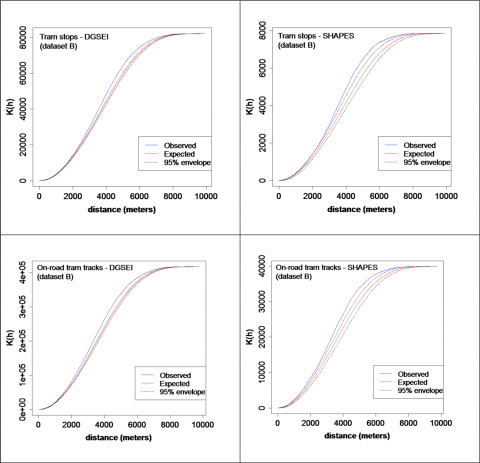 The univariate network K-function analyses were performed using SANET (Okabe et al., 2006a, 2006b), with the aim of testing whether reported and unreported cycling accidents tend to cluster (or not) at specific locations on the network. 23A cross (or bivariate) K-function can be used to compare the distribution of two sets of points (Cressie, 1993; Bailey and Gatrell, 1995). Given that cycling accidents are inherently network-constrained, a formulation extended to networks was used here (Okabe and Yamada, 2001). The expected distribution of values for the network cross K-functions is unknown. Therefore Monte Carlo simulations were used for estimating the expected values and their confidence envelopes (5% significance level). The observed and expected values of the network cross K-functions were then estimated to explore whether the reported and unreported cycling accidents were significantly clustered (or dispersed) with respect to specific infrastructure factors (see Okabe and Sugihara, 2012 for further details). 24The observed and expected values (as well as their confidence envelopes) are here represented by curves in graphs (e.g. Figure 2). Both sets of points significantly cluster if they are on the left of the 5% upper confidence interval, whereas they tend towards significant regularity or dispersion if they are on the right side of the 5% of the lower confidence interval. Both sets of points randomly distribute with respect to each other if observed values appear within the 95% envelope. 25Given complementary analyses (not reported here – see also Vandenbulcke, 2011), we can state that the final results proposed below are fairly robust, and hence do not depend on our methodological choices, even if recent publications appear to be very critical of SANET (Baddeley et al., 2016). 26In Table 2 (discrete factors), both chi-square adjusted tests and Fisher’s exact tests for independence indicate that – in most cases – the type of accident (reported or unreported) is not significantly associated with a particular type of infrastructure. This suggests that reported accidents are not more likely to occur at certain places/infrastructures than unreported accidents, which is confirmed by OR values that are around 1. Conversely, unreported accidents are about three times (OR = 3.21) more likely to occur than reported accidents in areas with 30km/h speed limitations and, more generally, in traffic-calming areas (Table 2). The small speed difference between slow and fast modes (created by the speed limits) probably explains this result. In the case of collision with a motorised vehicle in these areas, cyclists generally incur lesser injuries (and/or material damage) and do not feel the need to call the police. This may result in a lower rate of reporting of accidents (see also Bickel et al., 2006; Aertsens et al., 2010; de Geus et al., 2012). Moreover, this suggests that traffic-calming measures are an effective means to reduce the severity of cycling accidents. 27In places where no cycle facilities are observed as well as in streets where contraflow cycling is permitted, our results also suggest that cycling accidents are more likely to be unreported than elsewhere. Such findings should nevertheless be interpreted with caution as the survey data do not include any information about the direction of travel of the cyclist involved in the accident. 28The Wilcoxon rank-sum tests (Table 3) show that there are significant differences between reported and unreported cycling accidents at specific locations along the network. Interestingly, the unreported accidents from the SHAPES survey occur closer to public facilities (such as high schools and colleges) and specific types of parking areas (park-and-ride, taxi, public and private parking areas). As for traffic-calming areas, the larger occurrence of unreported cycling accidents close to most of these facilities and services is probably explained by the smaller speed difference between cyclists and motorised vehicles. The need to call the police is assumed to be reduced when slight accidents occur in these areas, mainly because of the low degree of accident severity and/or the involvement or not of an insurance contract (Vanparijs et al., 2016). 29It can be concluded here that reported and unreported cycle accidents exhibit similar locational tendencies, i.e. they are distributed in a similar way around specific types of road infrastructures and facilities. Areas where there is a lower speed difference between fast and slow road users are, however, exceptions to this general rule, suggesting that cycling accidents in such areas are more likely to be unreported. Great care should therefore be taken by planners and researchers when analysing (reported) cycling accidents in these areas; biased statistical inferences and incorrect interpretations could result from underreporting if official databases are used. 30Figure 1 shows that most of the cycling accidents occur in the Pentagon and the First Crown. This was to be expected as the densities and the number of cycling trips are higher in these areas. Strikingly, our results also indicate that the spatial mean centres computed for the two spatial distributions are very close to each other, and that the central features locate at the same place in the BCR (i.e. in the Central Business District, near European and regional administrations). The spatial distribution of reported cycling accidents shows the greatest deviation from the spatial mean, whereas unreported accidents tend to be less spatially dispersed. The standard deviational ellipses provide further information by highlighting a northwest–southeast orientation for both spatial distributions of accidents (this was to be expected as this corresponds to the areas where cycling is the most popular in the BCR). As a conclusion, our exploratory results clearly suggest that SHAPES unreported cycling accidents distribute over space in a similar way to DGSEI reported accidents. 31Network and cross K-function methods were computed for the three spatially nested areas of the city: Pentagon (A), Pentagon + First Crown (B), and Pentagon + First Crown + Second Crown, i.e. the entire BCR (C)). Five hundred Monte Carlo simulations were used in SANET to estimate the expected network K-function as well as its 95% upper and lower confidence intervals. Whatever the method used, the computation time strongly depends on the length of the network, the number of basic and non-basic points, and – to a lesser extent – the computer specifications. Overall, short to moderate computation times were required at the scale of the street network of dataset A (i.e. about 1–100 minutes depending on the number of points), whereas datasets B and C led to moderate to (very) high computation times (i.e. a number of minutes to about 6 days). 32The univariate network K-function method is used to test whether the reported (DGSEI) or unreported (SHAPES) cycling accidents cluster, repel or distribute at random across the network. 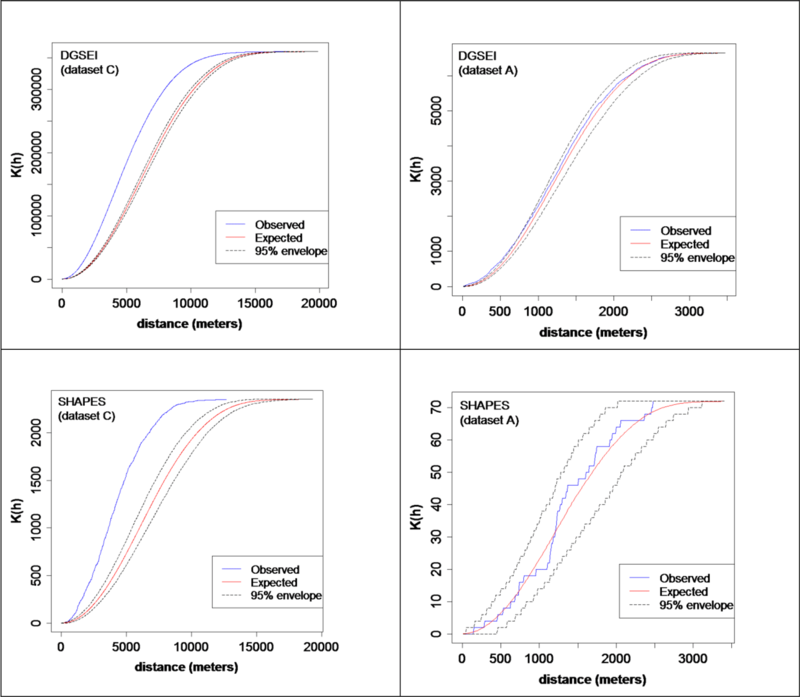 Table 4 indicates that both reported and unreported cycling accidents significantly cluster at almost all values of network distance (unreported accidents spatially cluster beyond 120 m) for both the B and C spatial datasets. Figure 2 illustrates our results for datasets A (right) and C (left). In dataset C, the observed values of the K-function (grey line) are to the left of the 5% upper confidence interval (upper dashed black line, obtained from the Monte Carlo procedure). By contrast, unreported accidents in the Pentagon (dataset A) are randomly distributed at all distances (the grey line appears within the 95% envelope in Figure 2, bottom right panel), while reported accidents cluster only up to a 750-m distance and then distribute at random for greater distances (Figure 2, upper right panel). 33The conclusions are twofold: (1) inferences about an observed spatial point pattern may depend on the subarea considered; and (2) reported and unreported cycling accidents, in a given spatial subarea, tend to distribute similarly across the road network (i.e. they both cluster along the network within a definite subarea). 34The bivariate network cross K-function method was applied to examine whether unreported and reported cycling accidents are observed close to each other, and whether they have different locational tendencies with respect to specific infrastructure factors. Table 4 and Figure 3 indicate that unreported cycling accidents tend to be located around the locations of reported accidents in datasets B and C, whereas this is true only for short distances (< 200 m) inside the Brussels Pentagon (dataset A). Such findings indicate that the results depend strongly on the spatial subarea considered. They also provide additional evidence that unreported and reported cycling accidents occur in similar locations, which suggests that they could occur at places with similar infrastructure factors. This is confirmed by Table 5, which shows that reported and unreported cycling accidents usually have similar point patterns around a specific infrastructure factor at the scale of a given spatial subarea. This is even more true for spatial datasets A and C, for which there is not the slightest dissimilarity in the patterns. The selection of a spatial subarea influences the final results. Moreover, the use of several subareas may provide complementary information. For instance, they may be a helpful way to check the consistency of the results or to detect the scale and distance threshold at which an observed point pattern (i.e. the cycling accidents) spatially clusters around specific locations (e.g. unreported cycling accidents occur around industrial estates beyond 5400 m, but only when dataset C (BCR) is chosen). 35When observed, dissimilarities in the spatial point patterns consistently occur at the scale of dataset B (Pentagon + First Crown) and notably concern bridges, marked cycle lanes, head-in angle parking places and industrial estates. Although not significant for the shortest distances, spatial clustering of reported cycling accidents is observed around such locations, whereas the spatial pattern tends to be random for the unreported accidents. Except for industrial estates, such a result is probably explained by the fact that the severity – and hence the registration of accidents – is higher when the cycling accident occurs on a marked cycle lane (car door-related accidents), a bridge (reduced space and higher speed), or near head-in angle parking (blind spot accidents). 36In line with previous results focusing on the Pentagon (dataset A), Table 5 shows that both reported and unreported cycling accidents distribute at random with respect to the infrastructure factors. Conversely, cycling accidents tend to cluster around most of these factors in datasets B and C. The presence of intersections, tram tracks, discontinuities in the bicycle network, schools and parking areas, inter alia, generally tends to be spatially associated with both reported and unreported cycling accidents. 37Although there is little difference between reported and unreported cycling accidents (especially for the Pentagon (A) and the BCR as a whole (C)), subtle differences can be identified at some (short) distances and/or at the level of significance of the spatial clustering of accidents around infrastructures. Such differences are also noted between the infrastructure factors. 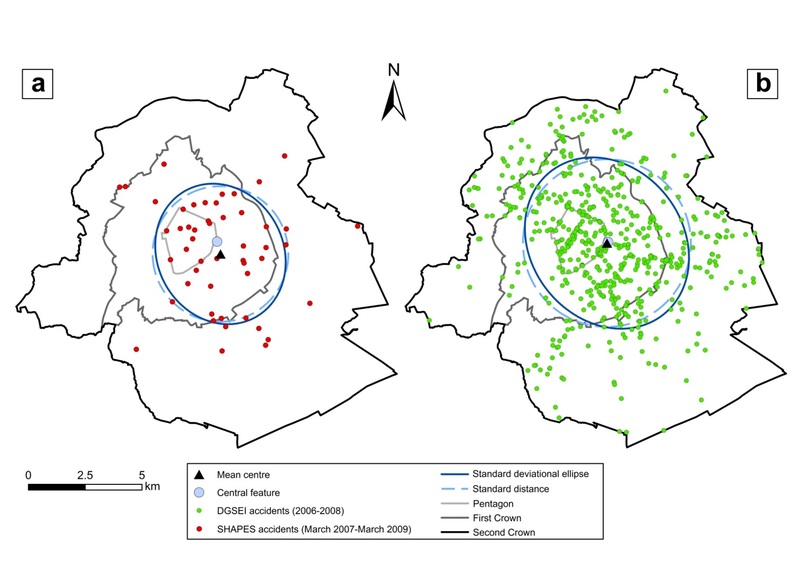 For instance, the results show that in dataset B unreported cycling accidents significantly cluster around tram stops beyond about 2000 m on the network (Figure 4, top right panel), whereas reported cycling accidents show significant spatial clustering for all distances (Figure 4, top left). This is probably explained by the fact that the severity – and thus the recording of an accident – is higher when it occurs in the vicinity of a tram stop; the high pedestrian flow may well increase the severity of the cycling accidents. Such a difference in spatial clustering is, however, not observed for on-road tram tracks: both reported and unreported cycling accidents cluster significantly around on-road tram tracks (Figure 4, bottom). This suggests that cycling accidents occurring in the vicinity of on-road tram tracks result in various degrees of accident severity. 38This paper aims at providing further knowledge about the spatial distribution of unreported cycling accidents, and specifically it analyses whether unreported and reported cycling accidents cluster similarly along the road network. Focusing on the Brussels-Capital Region, this paper combines official DGSEI data with data collected through a prospective online registration survey and for which there is no police record. 39The comparative statistics reveal that the two types of accidents tend to occur at similar locations, i.e. locations where similar road infrastructures and activities are observed. More interestingly, they also suggest that cycling accidents are more prone to be unreported in areas where there is a low speed difference between cyclists and motorised vehicles (e.g. in traffic-calming areas). Low speed reduces the severity of the cycling accidents and as a result decreases the propensity to call the police or to report the accident to the insurance company. On the one hand, this implies that the (positive) safety effect associated with the implementation of traffic-calming measures (for example) may be wrongly estimated because of the underreporting of a large proportion of small accidents in areas where these measures have been taken. On the other hand, it also suggests that traffic-calming measures may be effective infrastructures in reducing the severity of cycling accidents. This confirms former accident analyses conducted by Klop and Khattak (1999), ERSO (2006), the OECD (2006), Kim et al. (2007), and Eluru et al. (2008). 40Centrographic and network (cross) K-function methods confirm that unreported and reported cycling accidents have similar spatial patterns across the network, and that both cluster around the same infrastructures. Although the populations and definitions of accidents are not perfectly equivalent in both datasets, our findings suggest that improving the accident registration for cyclists by including unreported accidents would not necessarily provide further knowledge about (previously unobserved) spatial factors associated with the occurrence of cycling accidents (except for a few factors, such as head-in parking). Although often criticised for their biases, official accident databases may thus serve as a good basis for making policy decisions and (safety-oriented) investments regarding road and cycling infrastructure at a regional scale, although a more complete registration of cycling accidents could be required for local safety measures. Conversely, this paper also reveals that our own small survey data (SHAPES) may be considered as spatially representative of large official accident databases. 41Finally, our findings do not highlight only strong similarities in the locational tendencies of reported and unreported cycling accidents, but also emphasise the importance of employing several spatial subareas for conducting point pattern analyses. 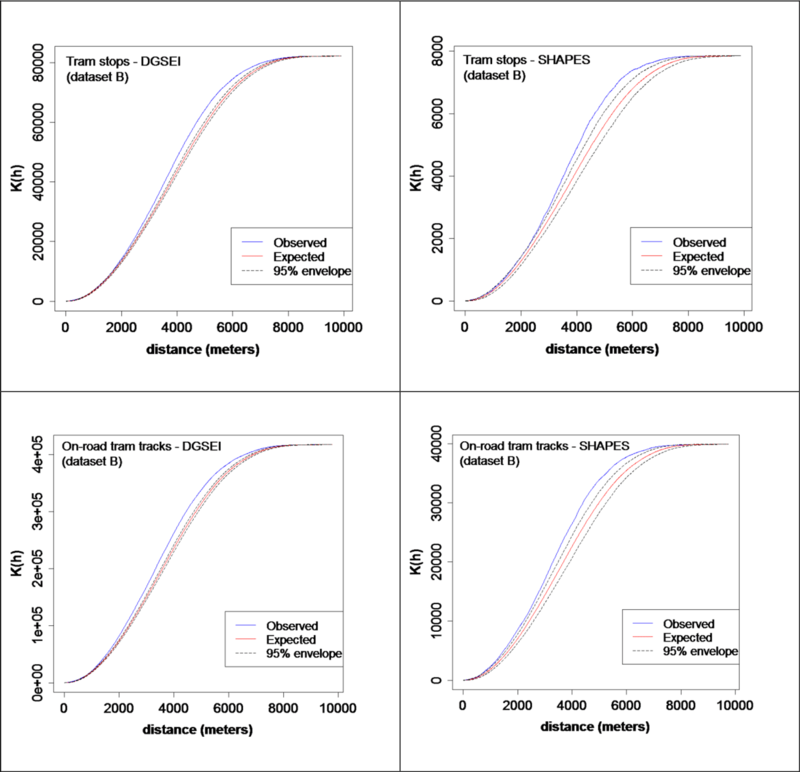 It is demonstrated here that the results of the network (cross) K-function methods strongly depend on the spatial subarea chosen and hence that they should be interpreted with great caution. 42From a methodological point of view, this research is limited to the spatial aspects of traffic accident data. Several factors related to individual attributes (e.g. gender, age, etc. ), temporal aspects (e.g. weather, time of the accident, etc.) or accident mechanisms (e.g. type of collision, etc.) are discussed in a companion paper (e.g. Degraeuwe et al., 2015). 43In addition to the data limitations, it is worth mentioning that several technical and methodological issues merit further research. In particular, the study would benefit from the inclusion of a background exposure variable (i.e. the bicycle traffic flows in the BCR, see Vandenbulcke et al., 2014) if the intention is to analyse the spatial patterns of unreported and reported cycling accidents separately from one another. The comparison of the two accident datasets is, however, expected to be unaffected, since both reported and unreported cycling accidents are ‘generated’ by the same bicycle traffic flows and both are expressed as a function of these flows. Moreover, the inability to differentiate the characteristics of the street (e.g. presence of parking places on the right side and presence of a marked bicycle lane on the left side), as well as the computational intensiveness related to the K-function and cross K­- function analyses (especially with large datasets and/or large network lengths), are other limitations that cannot be resolved in a straightforward way. 44Concerning data collected through the online registration system (SHAPES data), there are three regrettable and significant drawbacks: (1) the data are collected using an online system and hence mainly come from cyclists with access to a computer, an online network and a willingness to collaborate; (2) the data focus on regular adult cyclists (18–65 years old) for whom 60% of cycling trips are work-related (the remaining 40% are leisure-related); and (3) well-skilled cyclists, i.e. those who cycle longer distances and for a greater length of time than occasional cyclists, are more likely to be captured in the data. As a consequence, data collected throughout the online registration system are not representative of the population of cyclists (e.g. white-collar workers and people with a university degree are probably overrepresented). Great caution must therefore be taken when interpreting or extrapolating the results. This is also the case for other data sources such as insurance companies (Vanparijs et al., 2016) or new Application Programming Interfaces (APIs) that could be developed later, as is already the case for other transportation issues such as rail schedules (see e.g. Jones et al., 2016). Urban sensors and other CCTV mechanisms will hopefully be an alternative in the near future for locating and understanding cycling accidents. 45Regarding the statistical techniques employed, K-function methods have the drawback of being unable to test the significance of clustering along the network (Yamada and Thill, 2004). In addition, cross K-function methods do not take into account the potential interrelationships between different infrastructure factors. As a consequence, policy recommendations based on this point pattern exploration should be avoided. A multivariate analysis would be of great help in controlling for the presence of other (correlated) factors and in quantifying the importance of each separate effect. This is, however, beyond the scope of the current paper but opens up new avenues for further research. Aertsens J., de Geus B., Vandenbulcke G., Degraeuwe B., Broekx S., De Nocker L., Liekens I., Mayeres I., Meeusen R., Thomas I., Torfs R., Willems H., Int Panis L., 2010, ‘Commuting by bike in Belgium, the costs of minor accidents’, Accident Analysis and Prevention, Vol.42, No.6, 2149–2157. Baddeley A., Rubak E., Turner R., 2016, Spatial Point patterns: Methodology and applications with R, Chapter 17: ‘Point patterns on a linear network’, Chapman and Hall, CRC Interdisciplinary Statistics, 812 p.
Bailey T.C., Gatrell A.C., 1995, Interactive Spatial Data Analysis, Longman, Harlow (UK). BRSI (Belgian Road Safety Institute), 2006, Accidents de cyclistes en contexte urbain – Trois années (1998-2000) d’accidents corporels de cyclistes sur les voiries régionales de la Région de Bruxelles-Capitale. Brussels, IBSR/BIVV. BRSI (Belgian Road Safety Institute), 2008, Observatory for road safety. Evolution de la sécurité routière en Belgique (2000-2006). Brussels, IBSR/BIVV. BRSI (Belgian Road Safety Institute), 2009, Observatory for road safety. Rapport thématique : Cyclistes : Accidents de la route impliquant des cyclistes (2000-2007). Brussels, IBSR/BIVV. Cameron I.C., Harris N.J., Kehoe N.J.S., 2001, ‘Tram-related injuries in Sheffield’, Injury, Vol.32, No.4, 275–277. Cho G., Rodríguez D.A., Khattak A.J., 2009, ‘The role of the built environment in explaining relationships between perceived and actual pedestrian and bicyclist safety’, Accident Analysis and Prevention, Vol.41, No.4, 692–702. Cressie N.A.C., 1993, Statistics for Spatial Data, New York, Wiley. Dai D., Taquechel E., Steward J., Strasser S., 2010, ‘The impact of the built environment on pedestrian crashes and the identification of crash clusters on an urban University campus’, Western Journal of Emergency Medicine, Vol.XI, No.3, 294–301. Daniels S., Nuyts E., Wets G., 2008, ‘The effects of roundabouts on traffic safety for bicyclists: An observational study’, Accident Analysis and Prevention, Vol.40, No.2, 518–526. Daniels S., Brijs T., Nuyts E., Wets G., 2009, ‘Injury crashes with bicyclists at roundabouts: influence of some location characteristics and the design of cycle facilities’, Accident Analysis and Prevention, Vol.40, No.2, 141–148. de Geus B., Vandenbulcke G., Int Panis L., Thomas I., Degraeuwe B., Cumps E., Aertsens J., Torfs R., Meeusen R., 2012, ‘A prospective cohort study on minor accidents involving commuter cyclists in Belgium’, Accident Analysis and Prevention, Vol.45, 683–693. Degraeuwe B., de Geus B., Thomas I., Meeusen R., Int Panis L., 2015, ‘Cycling behaviour and collision risk of utilitarian cyclists in Belgium’. Chapter 2 in: Gerike R., Parkin J. (eds. ), Cycling Futures: From Research into Practice, London, Ashgate Publishing, 33–51. de Hartog J.J., Boogaard H., Nijland H., Hoek G., 2010, ‘Do the health beneﬁts of cycling outweigh the risks?’, Environmental Health Perspectives, No.118, 1109–1116. De Mol J., Lammar P., 2006, ‘Helft verkeersslachtoffers komt niet in statistieken’, Verkeersspecialist, No.130, 15–18. Doom R., Derweduwen P., 2005, Optimalisatie van de verkeersongevallenstatistieken. Research contracts CP/02/392, CP/F1/391 (final report) for BRSI, CDO and Belgian Science Policy. Dujardin C., Thomas I., Tulkens H., 2007, ‘Quelles frontières pour Bruxelles ? Une mise à jour’, Reflets et Perspectives de la Vie Economique, No.46, 156–176. Dumbaugh E., Rae R., 2009, ‘Safe urban form: revisiting the relationship between community design and traffic safety’, Journal of the American Planning Association, Vol.75, No.3, 309–329. Ebdon D., 1985, Statistics in Geography: A Practical Approach (2nd edition), Oxford, Wiley-Blackwell. Eluru N., Bhat C.R., Hensher D.A., 2008, ‘A mixed generalized ordered response model for examining pedestrian and bicyclist injury severity level in traffic crashes’, Accident Analysis and Prevention, No.40, 1033–1054. Elvik R., 2006, ‘Laws of accident causation’, Accident Analysis and Prevention, No.38, 742–747. ERSO (European Road Safety Observatory), 2006, Pedestrians and cyclists. Retrieved 4-17-2011 from www.erso.eu. ESRI (Environmental Systems Research Institute, Inc.), 2009, Measuring Geographic Distributions Toolset. Redlands, CA (USA). Fotheringham A.S., Brunsdon C., Charlton M., 2000, Quantitative geography: Perspectives on spatial data analysis. London, Sage Publications. Geurts K., Thomas I., Wets G., 2005, ‘Understanding spatial concentrations of road accidents using frequent item sets’, Accident Analysis and Prevention, Vol.37, No.4, 787–799. Greibe P., 2003, ‘Accident prediction models for urban roads’, Accident Analysis and Prevention, Vol.35, No.2, 273–285. Hedelin A., Björnstig U., Brismar B., 1996, ‘Trams: A risk factor for pedestrians’, Accident Analysis and Prevention, Vol.28, No.6, 733–738. Hels T., Orozova-Bekkevold I., 2007, ‘The effect of roundabout design features on cyclist accident rate’, Accident Analysis and Prevention, Vol.39, No.2, 300–307. Int Panis L., Meeusen R., Thomas I., Aertsens J., de Geus B., Degraeuwe B., Frère J., Torfs R., Vandenbulcke G., Willems H., Jacobs L., Nawrot T., 2011, SHAPES – Systematic Analysis of Health Risks and Physical Activity associated with Cycling Policies. Research contract SD/HE/03A (final report) for Belgian Science Policy. Jones A.P., Langford I.H., Bentham G., 1996, ‘The application of K-function analysis to the geographical distribution of road traffic accident outcomes in Norfolk, England’, Social Science and Medicine, Vol.42, No.6, 879–885. Jones J., Cloquet C., Adam A., Decuyper A., Thomas I., 2016, ‘Belgium through the lens of rail travel requests: Does geography still matter?’, International Journal of Geo-Information, Vol.5, No.11, 216. Khan G., Santiago-Chaparro K.R., Qin X., Noyce D.A., 2009, ‘Application and integration of lattice data analysis, network K-functions, and GIS to study ice-related crashes’, Transportation Research Record: Journal of the Transportation Research Board, No.2136, 67–76. Kim J-K., Kim S., Ulfarsson G.F., Porrello L.A., 2007, ‘Bicyclist injury severities in bicycle-motor vehicle accidents’, Accident Analysis and Prevention, Vol.39, No.2, 238–251. Klop J.R., Khattak A.J., 1999, ‘Factors influencing bicycle crash severity on two-lane, undivided roadways in North-Carolina’, Transportation Research Record, 1674, 78-85. Krizek K., Roland R.W., 2005, ‘What is at the end of the road? Understanding discontinuities of on-street bicycle lanes in urban settings’, Transportation Research Part D, Vol.10, 55–68. Lammar P., Hens L., 2004, Onderzoek naar het gebruik van ziekenhuisgegevens: Minimale Klinische Gegevens, Steunpuntverkeersveiligheid, Diepenbeek. Lammar P., Hens L., 2006, Haalbaarheidsstudie voor de corrective van de ongevallengegevens – Eindrapport, Steunpuntverkeersveiligheid, Diepenbeek. Levine N., Kim K.E., Nitz L.H., 1995a, ‘Spatial analysis of Honolulu motor vehicle crashes: I. Spatial patterns’, Accident Analysis and Prevention, Vol.27, No.5, 663–674. Levine N., Kim K.E., Nitz L.H., 1995b, ‘Spatial analysis of Honolulu motor vehicle crashes: II. Zonal generators’, Accident Analysis and Prevention, Vol.27, No.5, 675–685. McClintock H., Cleary J., 1996, ‘Cycle facilities and cyclists’ safety: Experience from Greater Nottingham and lessons for future cycling provision’, Transport Policy, No.3, 67–77. Møller M., Hels T., 2008, ‘Cyclists’ perception of risk in roundabouts’, Accident Analysis and Prevention, Vol.40, No.3, 1055–1062. Myint S.W., 2008, ‘An exploration of spatial dispersion, pattern, and association of socio-economic functional units in an urban system’, Applied Geography, Vol.28, No.3,168–188. Okabe A., Okunuki K-I., Shiode S., 2006a, ‘SANET: A toolbox for spatial analysis on a network’, Geographical Analysis, Vol.38, No.1, 57–66. Okabe A., Okunuki K-I., Shiode S., 2006b, ‘The SANET toolbox: New methods for network spatial analysis’, Transactions in GIS, Vol.10, No.4, 535–550. Okabe A., Satoh T., Sugihara K., 2009, A kernel density estimation method for networks, its computational method and a GIS-based tool’, International Journal of Geographical Information Science, Vol.23, No.1, 7–32. Okabe A., Sugihara K., 2012, Spatial Analysis along Networks: Statistical and Computational Methods, Chichester, John Wiley. Okabe A., Yamada I., 2001, ‘The K-function method on a network and its computational implementation’, Geographical Analysis, Vol.33, No.3, 271–290. Pai C-W., 2011, ‘Overtaking, rear-end, and door crashes involving bicycles: An empirical investigation’, Accident Analysis and Prevention, Vol.43, No.3, 1228–1235. Parkin J., Wardman M., Page M., 2007, ‘Models of perceived cycling risk and route acceptability’, Accident Analysis and Prevention, Vol.39, No.2, 364–371. Pei X., Wong S.C., Sze N.N., 2010, ‘A joint-probability approach to crash prediction models’, Accident Analysis and Prevention, Vol.43, No.3, 1160–1166. Pucher J., Buehler R., 2008, ‘Making cycling irresistible: Lessons from the Netherlands, Denmark and Germany’, Transport Reviews, Vol.28, No.4, 495–528. Pucher J., Dijkstra L., 2003, ‘Promoting safe walking and cycling to improve public health: Lessons from the Netherlands and Germany’, Public Health Matters, Vol.93, No.9, 1509–1516. Pucher J., Dill J., Handy S., 2010, ‘Infrastructure, programs, and policies to increase bicycling: An international review’, Preventive Medicine, No.50, 106–125. Quddus M.A., 2008, ‘Modelling area-wide count outcomes with spatial correlation and heterogeneity: An analysis of London crash data’, Accident Analysis and Prevention, Vol.40, No.4, 1486–1497. Rabl A., de Nazelle A., 2012, ‘Assessment of health costs and benefits for active transport’, Transport Policy, No.19, 121–131. Reynolds C.C.O., Harris M.A., Teschke K., Cripton P.A., Winters M., 2009, ‘The impact of transportation infrastructure on bicycling injuries and crashes: A review of the literature’, Environmental Health, Vol.8, No.47. Rifaat S.M., Tay R., de Barros A., 2011, ‘Effect of street pattern on the severity of crashes involving vulnerable road users’, Accident Analysis and Prevention, Vol.43, No.1, 276–283. Ripley B., 1976, ‘The second-order analysis of stationary point processes’, Journal of Applied Probability, No.13, 255–266. Ripley B., 1981, Spatial Statistics, Chichester (UK), Wiley. Thisse J-F., Thomas I., 2010, ‘Bruxelles au sein de l’économie belge : un bilan’, Regards Economiques, No.80. 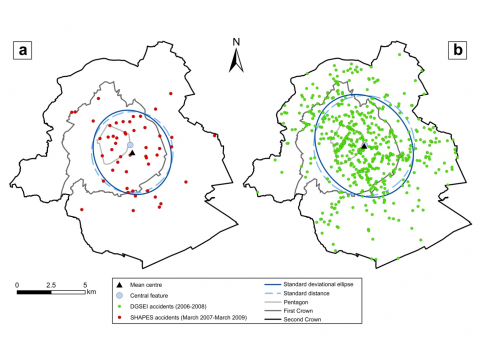 Vandenbulcke G., Thomas I., Int Panis L., 2014, ‘Predicting cycling accident risk in Brussels: An innovative spatial case-control approach’, Accident Analysis and Prevention, Vol.62, 341–357. Vandenbulcke G., 2011, Spatial Analysis of Bicycle Use and Accident Risks for Cyclists, PhD dissertation, Faculty of Sciences, Université catholique de Louvain, Louvain-la-Neuve. Vanparijs J., Int Panis L., Meeusen R., de Geus B., 2016, ‘Characteristics of bicycle crashes in an adolescent population in Flanders (Belgium)’, Accident Analysis and Prevention, Vol.97, 103–110. Unger R., Eder C., Mayr J.M., Wernig J., 2002, ‘Child pedestrian injuries at tram and bus stops’, Injury, Vol.33 No.6, 485–488. Wang Y., Nihan N.L., 2004, ‘Estimating the risk of collisions between bicycles and motor vehicles at signalized intersections’, Accident Analysis and Prevention, Vol.36, No.3, 313–321. Wedagama D.M.P., Bird R.N., Metcalfe A.V., 2006, ‘The influence of urban land-use on non-motorised transport casualties’, Accident Analysis and Prevention, Vol.38, No.6, 1049–1057. Yamada I., Thill J-C., 2004, ‘Comparison of planar and network K-functions in traffic accident analysis’, Journal of Transport Geography, Vol.12, No.2, 149–158. 1 Definitions in Belgium: (1) fatality = accident resulting in one or more road users dying, either at the place of accident or within the next 30 days (due to the accident-related injuries); (2) severe/serious = accident resulting in one or more road users being seriously injured and for whom a hospitalisation of more than 24 hours was reported; (3) slight = accident resulting in one or more road users being slightly injured, with hospitalisation of less than 24 hours.